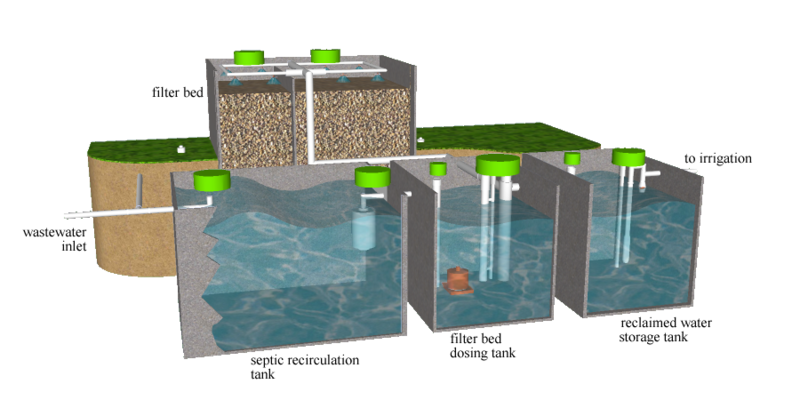 This high performance biofiltration treatment system is based on intermittent "sand" filter technology, which is one of the oldest, most robust, and most inherently stable sort of treatment process available. The modern version of this technology employs gravel rather than sand media – or can employ various types of synthetic media, which allow higher real loading rates on the filter beds – and system design features such as flow equalization which makes the high performance biofiltration system even more stable and robust. This treatment process consistently and reliably produces a very high quality effluent, typically <15 mg/L of both BOD and TSS. With appropriate design, the system can also reduce the nitrogen concentration in the effluent to ~15 mg/L. The only power requirement is to move the water to the top of the filter bed to be sprayed over the media, which is an intermittent low head lift, so the power requirements for this process are very low for a high quality treatment unit. The high performance biofiltration system is an excellent choice for small-scale treatment units, as they can be set up and left to routinely operate, day by day, without active intervention. As long as one could remotely monitor any alarms – in the main these would signal a pump failure – there would be no reason to even visit the plant site very often, since all the scheduled maintenance activities – which are minimal in any case – are required at long intervals. All these factors make the high performance biofiltration concept an excellent choice for distributed treatment units inherent in a decentralized concept wastewater management strategy.